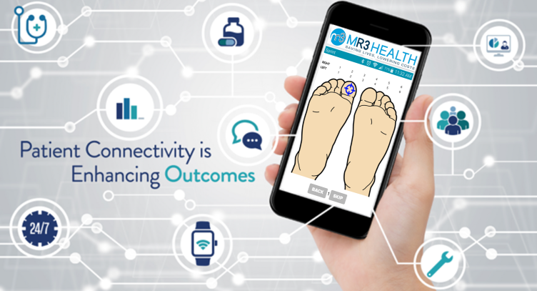 MR3 Health is a dynamic company bringing an innovative combination of service and preventive technology to patients and insurers to assist in dealing with diabetic foot issues, while reducing the cost of healthcare. 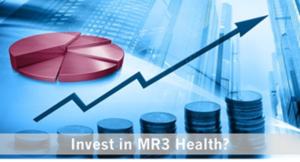 Although we are a young company, MR3 Health is uniquely positioned for success with a number of resources unknown to most start-ups. These include issued patents, an FDA cleared medical device supported by clinical trials, and a management team with a wealth of business, manufacturing and medical experience. Diabetes is a rapidly growing problem both in the United States and abroad. 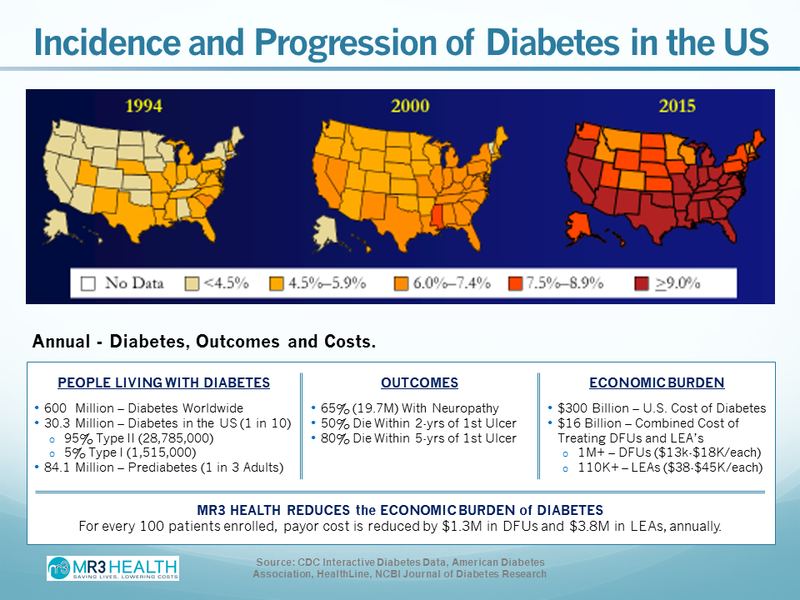 According to figures from the Centers for Disease Control (CDC), the prevalence of diabetes in the U.S. doubled over a 20-year period from 1994 to 2015 (see map). Currently, 1 in 10 Americans, a total of 30.3 million, are diagnosed with the disease. Complications, like diabetic neuropathy, lead to nerve damage and loss of sensation in the sole of the foot while inflammation leads to undetected pressure ulcers. In the U.S., about 80 percent of lower limb amputations started off as a diabetic foot ulcer. According to figures cited in a recent article in The New England Journal of Medicine, a total of $176 billion is spent annually in the United States on direct costs for diabetes care, a figure exceeding treatment costs for many common cancers. As much as one-third (approximately $58 billion) of those costs are lower-extremity-related. Data on Medicare beneficiaries reported under the auspices of the Agency for Healthcare Research and Quality indicates that medial expenditures are thought to be 2.3 times higher in people with diabetes than those without the disease. Many of these costs are likely to be related to the complications associated with diabetes like diabetic foot ulcers (DFUs) and lower extremity amputations (LEAs). The report also states that among the Medicare Fee-For-Service (FFS) population with a DFU the average number of office visits per year is around 14 and they are hospitalized on average 1.5 times per year. The average Medicare reimbursement (2008) for all their services was $35,000. Among the same population, those with an LEA had an average of 12 office visits per year and were hospitalized twice. The average Medicare reimbursement for all their services was approximately $51,000. Without early detection and treatment, ulcers become infected frequently leading to full or partial amputation of the foot or lower limb. Of the estimated 600 million people living with diabetes worldwide, someone suffers an amputation, on average, every 30 seconds. Most significantly, the life expectancy of a diabetic amputee is less than five years. MR3 Health offers an effective solution for the prevention of these complications.